If you don’t have someone who’s passionate about things, they’re not going to do it differently than someone who’s done it before. Wave pools for surfing date back more than 50 years, but even the best pale in comparison to a good ocean surf spot. In the ocean, storms create surface gravity waves that roll along in deep water and only interact with the bottom, or shoal, when the water depth is about half the length of the distance between successive crests (the wavelength). Three things then happen: The wavelength shortens, the height increases, and the crest moves faster than the wave’s lowest point, the trough. When the height of the wave is about the same as the water’s depth, the wave breaks and surfers surf. If the bottom has just the right contour and the wind blows from land to sea or is still, a swell is transformed into a breaking wave that peels evenly to the left or the right, with the white water moving across the wave’s face like a steadily closing curtain. Steeper waves can pitch into a tube, allowing more skilled surfers to ride for a few seconds inside the barrel. A 30-second ride on an ocean wave is remarkably long, and few spots consistently offer barrels. In 2006, Slater, the world’s most famous surfer, approached Fincham, who took on the challenge of mimicking nature in a tank. “I had no idea who he was,” says Fincham, who grew up in Jamaica and began surfing only when he came to USC. To develop the wave, Slater founded his own eponymously named company, which promptly hired Fincham. Fincham is, by several accounts, wildly creative and dogged. He’s published works on such esoteric-sounding topics as digital particle imaging velocimetry for laser diagnostics to decaying grid turbulence in a rotating stratified fluid. But Slater jokes that he and Fincham both have a touch of obsessive-compulsive disorder. “If you don’t have someone who’s passionate about things, they’re not going to do it differently than someone who’s done it before,” Slater says. Tanks in labs typically make waves a few centimeters tall, which can be modeled with linear equations: What you put in reliably predicts what’s produced. But trying to mimic a larger swell by generating steep waves unleashes nonlinear forces, including turbulence; a thin, slow-moving layer atop the swell (“the boundary layer”); and oscillations of the entire water body called seiching. “Nonlinearity is everywhere,” Eiff says—which makes it fiendishly difficult to plot out an artificial wave. The scientific literature on wave sculpting doesn’t run deep. Fincham and Slater’s U.S. patent applications reference just two scientific papers about waves, both written by prominent physicists/mathematicians in the 1870s. So aside from other patent filings on surfing waves, Fincham and Slater were largely on their own. They began in a laboratory wave tank. Whereas many wave pools use paddles, plungers, caissons, or other strategies to effectively throw water into the air, Fincham’s team designed a hydrofoil that is partially submerged in water. As it cuts through the pool, the hydrofoil moves water to the side (but not upward) and then pulls back on the forming wave to “recover” some of the water it pushed away. The result is what physicists call a solitary wave, or soliton, that mimics an individual swell in the open ocean. Then Slater’s surfing experience came in. “It was [Fincham’s] job to figure out how to make that swell, and it was my job to figure out how to break that swell,” he says. It takes a shallow “reef” of just the right shape to turn a swell into a surfing wave. To fine-tune the shape of the pool bottom, the team relied on Slater’s input and on massively parallel supercomputers that often had to run for weeks at a time to complete a simulation. In silico, a wave is a mesh of millions of cells that represent air and water. Computations for each of the cells and how they interact with each other simulate the evolving wave as it develops a face and a barrel. The computations are “mathematically horrendous,” says Geoffrey Spedding, a USC fluid mechanics specialist who has collaborated with Fincham but had little input on this project. Fincham’s team transferred the lab findings to the Surf Ranch, a rectangular pool that was originally an artificial water skiing lake. The hydrofoil—imagine a vertically oriented, curved, stubby airplane wing—sits in water a few meters deep. It’s attached to a contraption that’s the size of a few train cars and, with the help of more than 150 truck tires and cables, runs down a track for the length of the pool at up to 30 kilometers per hour. This creates a soliton that stands more than 2 meters tall. 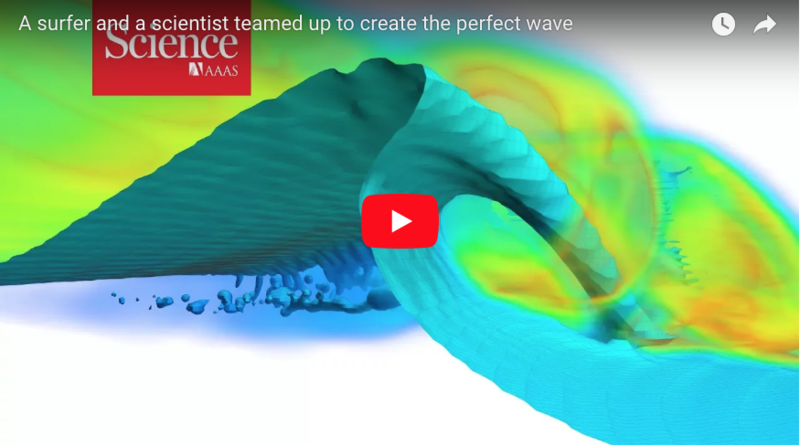 The pool’s bottom, which has the springy feel of a yoga mat, has different slopes in different parts, and the contours determine when and how the soliton breaks. The patents also describe “actuators” in the hydrofoil that make it possible to adjust the size and shape of the wave to suit different skill levels. The hydrofoil moves up the pool to create a wave that breaks from right to left. Giant gutters serve as dampers to reduce the seiching and limit bounce back from the walls that border the pool, but it takes 3 minutes for the waters to calm. Then the hydrofoil travels back down the pool and forms a wave that breaks in the opposite direction. The ride can last for a ridiculously long 50 seconds, and the wave alternates between big faces to carve on and barreling sections. Onlookers hooted wildly during that September contest when Stephanie Gilmore, who has won the women’s title six times, stayed in the barrel for an astonishing 14 seconds. Lochtefeld, whose FlowRider is in 200 venues, contends the hydrofoil scheme has too many mechanical elements. “It’s fraught with breakdowns,” he says. “And when you have that class of energy transfer and that much water in motion, the pool gets so screwed up.” Nor would it be a moneymaker, he says. By Lochtefeld’s calculation, you need to create a wave at least every 10 seconds—or at least a million waves per year—to make a profit on an artificial surfing wave. Wavegarden, a Spain-based company that makes ocean-like waves ridden on regular boards and is open to the public at two locations, boasts that it can produce waves every 4 seconds. But WSL Holdings—which won’t reveal how much it has invested or what it costs to run the Surf Ranch—does not plan to sell rides on waves per se. In addition to holding pro contests, the company hopes to build surf parks with hotels, concert venues, and retailers. Slater envisions that wealthy surfers might want to buy into luxury, private resorts built around a wave, similar to the Discovery Land Company’s high-end golf communities around the world. And Fincham and crew have wave improvements in the works, including testing different reefs, increasing the swell size, and even adding giant fans to control the wind. Then again, there’s something supernatural about the wave they’ve already created. Ask the select few who have visited the Surf Ranch and seen the wave break. They aren’t wistfully telling their friends about what they saw yesterday. They’re talking about having seen tomorrow.